...does not diminish when we get older. How is an old Grandma like me supposed to keep up with all the hand signals the 'cool' kids use? Growing up we only knew one hand signal. And it was the one that would get us grounded if we ever used it around our parents. I'm certain you know the one to which I am referring. This week I started school shopping with Grandlittles. The middle girl got to go first this year. After trying on 23 pairs of shorts that looked EXACTLY alike (Seriously. How can they even tell the difference? ), we finally ended up at the $5 photo booth. 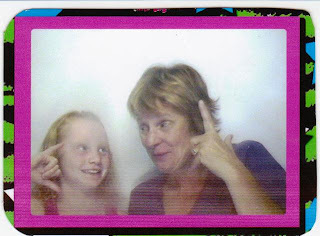 We took three silly pictures and on the fourth and final picture, my Grandlittle said, 'Grandma! Call me! Call me!" and held up her fingers in a 'call me' hand signal. I thought I did pretty good. Apparently, at least according to Riley... I did not! She and her sisters had an uproarious laugh over my botched 'call me' hand signal. I was quick with an explanation, though. I told them my hand signal was the latest and coolest one and it meant 'call me OR text me OR IM me!' but they didn't buy it. They didn't buy it in the slightest. Trying to be a cool Grandma is so exhausting. ...just use the new hand signal. I have always had trouble getting my signals right. I give you a great big giant A for effort! Seriously, after shopping with a preteen...how can you possibly be prepared to learn new hand signals? I think you girls are too cute:) It is tough for us OLD gals to keep up with the youngstas! Have a blessed day, HUGS! LOL! I think you are the coolest J!! Always a delight to read your posts, Jenny! At least you middle little knows what sign to look for now if you signal her to call you. I give up trying to be cool and figure out all the latest! Of course as my Grand gets older I may have to try to be cool again....not easy is it! I'm signaling - can you see me? Thank heavens the boys are still too young to care that I'm not cool. Perhaps by the time they're older they'll think I'm sweetly old and amusing - that would be good too!....and perhaps a little eccentric. It was MY MOM that used that (bad) hand signal, in front of one of my classmates, in the middle of Penny's! Can you believe that? I was mortified! It got back to the school and everyone thought my Mom was cool. MY MOM! I'm pretty good with hand signals, but not that particular "call me" one. It's that "other" one I am good with, especially in traffic when some truck with those huge tires, the metal actually vibrating from the ear piercing music playing, and a drive who is actually bouncing to the beat tries to cut me off. Then I am great with hand signals, and word signals as well. Aw...you are cool! WE old grammies have our own brand of coolness! Love the photos! Have you seen the Olympic swim team video? I LOVE that song! I know that is where all the kids got that hand signal! I have learned to put the tall man finger into a graceful prayer as I drive! A good friend taught me that on the highway once when all the crazies were passing her! She told me to fold my middle finger up in prayer! I do it all the time now! I'm also sorry to say, that it was my mother who usually used the hand single that got you in trouble. I think you are the coolest grandma ever! LOL ....yes Jenny, you better work on that "cool" CALL ME hand signal. ;) That's cute!